Adrian Delia made a short presentation, denying all claims levelled against him regarding domestic violence, money laundering and issues related to his personal finances. 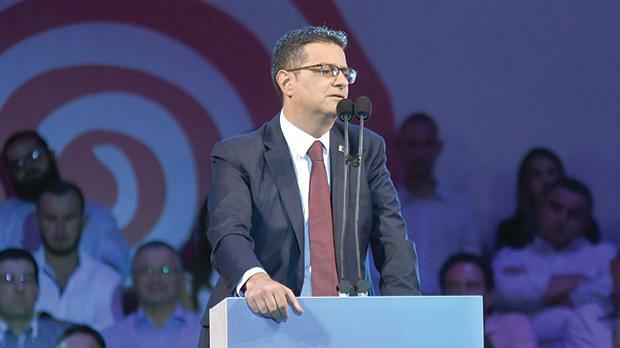 A unanimous declaration of support for Nationalist Party leader Adrian Delia by the administrative council followed a show of hands by the members, Times of Malta has learnt. Sources said the statement was drafted after a lengthy debate on Wednesday evening, following which those present were first asked if they had any objections and, then, whether they approved the declaration. “Nobody raised their hands when asked if they were against or were abstaining,” the sources said. Times of Malta sought official confirmation from the PN on the matter but no reply was received by the time of writing. Contrary to what Dr Delia had said, the four-hour meeting focused almost entirely on his future at the helm of the party, the sources noted. “The approval of a group of local council candidates for next May’s election was just a formality,” they said. During the meeting, Dr Delia made a short presentation, denying all claims levelled against him regarding domestic violence, money laundering and issues related to his personal finances. Though the long debate and explanations by Dr Delia failed to quell certain doubts and concerns raised, even his most vociferous critics ended up toeing the party line and expressing their support, the sources said. An administrative council member who spoke to this newspaper on condition of anonymity confided that he reluctantly endorsed the declaration because he felt that “trying to start a rebellion at this point in time would be political suicide”. However, the same member acknowledged that the decision not to rock the boat meant that, after the meeting, he faced a backlash from those who had pinned their hopes on him for the party to take some sort of action. “Calling for Dr Delia’s head, without having a plan on the way forward as to who would take over at least till May’s European and council elections, would have been madness,” he insisted. “Such a move would have meant going back to square one. While scoring points and garnering support with the PN leader’s critics, such gains would have been eclipsed by a backlash from his supporters,” the council member remarked. Admitting he was tempted to call it a day and resign from the party, he told Times of Malta that doing so would be tantamount to capitulating. “For the time being, the only option is to wait till May’s elections and have another go but only if the PN did badly. A good result would kill any lingering dissent against Dr Delia unless fresh allegations crop up in due course,” he said.